Well, I really am not a fan of this dog blog post. Hmmpf! I really don’t like taking dog baths! But Mom does tend to give me one every 3 weeks or so. I guess that’s the price I have to pay to go on therapy dog visits, yappy hours, dog play dates, and to even have a girlfriend! Yes, I’m dating a wonderful Cavalier King Charles Spaniel named Sabrina Furchild. Ooh la la! Mom has been trying to get healthier, and now that includes me! She has been blogging about her own personal health care; you can visit Mom’s healthier lifestyle blog here. First up, you will need to have the right dog bathing supplies ready. Mom’s must-haves include a rubber shower mat so I don’t slip, shower hair catcher, handheld shower nozzle, dog towels, my drying jacket from Dexter’s Jackets, and of course a dog shampoo! 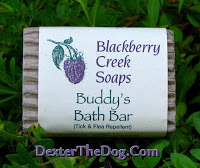 Today we tried a new natural dog shampoo called Buddy’s Bath Bar by Blackberry Creek Soaps. This natural dog shampoo is also supposed to help with fleas and ticks! Bonus! 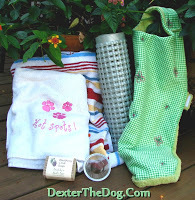 Check out our post on healthy, non-toxic flea and tick control. This is the first time Mom has ever used a bar soap on me. I have such silky fur, and we try to keep it looking white and soft. She’s unsure how well it will work because she hasn’t been happy with her own human soap shampoo bars. First up, the ingredients. They include water, coconut oil, olive oil, palm oil, sodium hydroxide, castor oil, jojoba oil, aloe vera oil, cedar, citronella, eucalyptus, and pennyroyal. Yum! Okay, I’m not supposed to eat the soap either, but sounds pretty tasty! The hydroxide is something Mom wasn’t sure of. But the manufacturer said it’s safe after it’s processed. You can read about it here. Next up was how it lathered. The natural dog shampoo bar lathered up nicely. Then there was the smell. Yes, this dog shampoo smelled really good! After a good lathering and scrubbing, came the dog rinse. This is where Mom wasn’t too happy. She said it felt sticky and kind of gummy, like the human shampoo bars she isn’t fond of. But she kept going. She dried me off with a dog towel, put my dog drying jacket on, I shook off the excess water and off I went! I air dry, so the final step took a few hours. Mom brushed me up and was pleasantly surprised. I no longer felt sticky or gummy. However, I am not as shiny or soft as I usually am after my dog bath. To the natural dog bar shampoo’s credit, Mom did not use a dog cream rinse like she normally does. So the verdict….not bad. It’s just day one, so I will update as the week goes on. Mom feels good that it is a safer product than a lot of dog shampoos on the market. She is in the learning stage of understanding cosmetic ingredients, so I’m sure there will be more on dog shampoos in the future. 8/27/2013 Update: It’s been a good week now since my bath. I’m still very white, and Mom said she’s happy with the results considering this dog bar shampoo is pretty safe and nontoxic! How does your dog do during his bath? Tell me in the comments.